Infectious beats, punchy horns, bright colors, and several powerful vocalists is what Brooklyn’s funk powerhouse Turkuaz is known for. The band, who started touring full time in 2012, have made a name for themselves on the scene with a dynamic live show and strong albums that draw as much from The Talking Heads as they do Sly and the Family Stone. But, for many newbies, it’s a rainbow of colors that really sticks in their head as they wipe the sweat from their brow at the end of the night. Today that well-orchestrated color scheme is a defining element of the band. George Clinton and P-Funk had neon braids. Prince had purple suits and symbols. 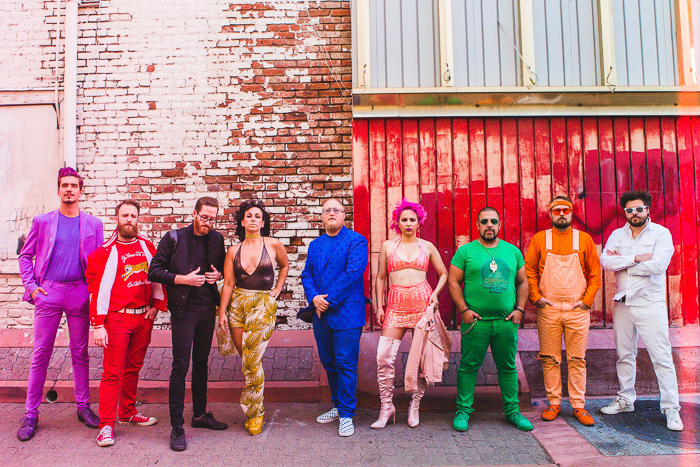 And Turkuaz, well they’ve got a rainbow of color that they back with a diverse repertoire that may flirt with rock and R&B but never strays far from dance floor packing funk. With their most recent album Life In The City, Turkuaz presents a concise, nine-track album three years after dropping Digitonium, a 24 track opus that draws heavily on, and is rumored to synch up perfectly with Disney’s animated classic The Sword in the Stone. While Brandwein said that the recording process was similar for both albums, he acknowledged that the band had to be much more selective when finalizing their recent release. The album, which clocks in right around 44 minutes (in contrast, Digitonium’s 80), is an album in the truest sense of the form and begs to be listened to from beginning to end. Along the way the listener is treated to some true gems including Brandwein’s confessional “The One and Lonely” and Schwartz’s hypnotic “If I Ever Fall Asleep,” the latter produced by The Talking Heads Jerry Harrison, showcases the many weapons in the band’s arsenal and allowed Turkuaz to work with one of their heroes. The product of their first foray in the studio together, the standalone single “On The Run” was released in late 2017 and proved right away that this relationship was going to bear fruit. So much so that the band invited him back when they were working on Life In The City. “He was really honest about the things that he could see room for improvement on and challenged some very basic ideas — even just the tempo we were playing songs at in the studio. He was pushing us to slow them down a little bit, occasionally — which is hard to believe because both the songs we did are still pretty fast — but believe it or not they were faster before he got his hands on them,” laughed Brandwein. While the music of Turkuaz tends to elicit feel-good party vibes, the bass-heavy “The One and Lonely” deals with the darker side of life on the road as Brandwein used the song to process an internal struggle he was having with alcohol.